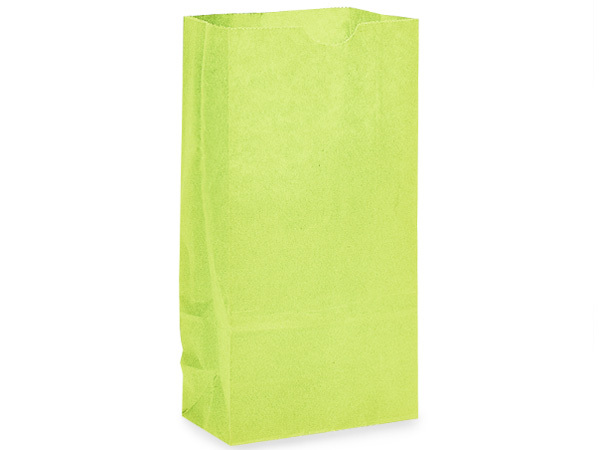 2 lb 4.25 x 2.25 x 8" 4 lb 5 x 3 x 9.5" 6 lb 6 x 3.5 x 11" 8 lb 6.25 x 4 x 12.5"
Lime Green SOS style Paper Gift Sacks in bulk cartons. Small 4-1/4x2-3/8x8-3/16" sacks are used for gift bags, candy & cookies, jewelry and party favors. Made in the USA. Our Solid Color Paper Gift Bags are available in many sizes and colors and are either beater dyed paper or printed with water based inks. Use these gift sacks for small paper gift bags, party favors and much more. Made in the USA.